I have a soft spot for all-day breakfasts, especially the kind that includes eggs in any form and freshly sauteed mushrooms. When I visited Feeka Coffee Roasters for lunch, it was because of a suggestion from my colleague who has also never been there. This isn't my usual hang out area - I don't usually frequent the heart of KL - so I was pretty open to any suggestions. I didn't quite expect this day to be one of those breakfast for lunch sort of days. Feeka can be found on Jalan Mesui in KL. 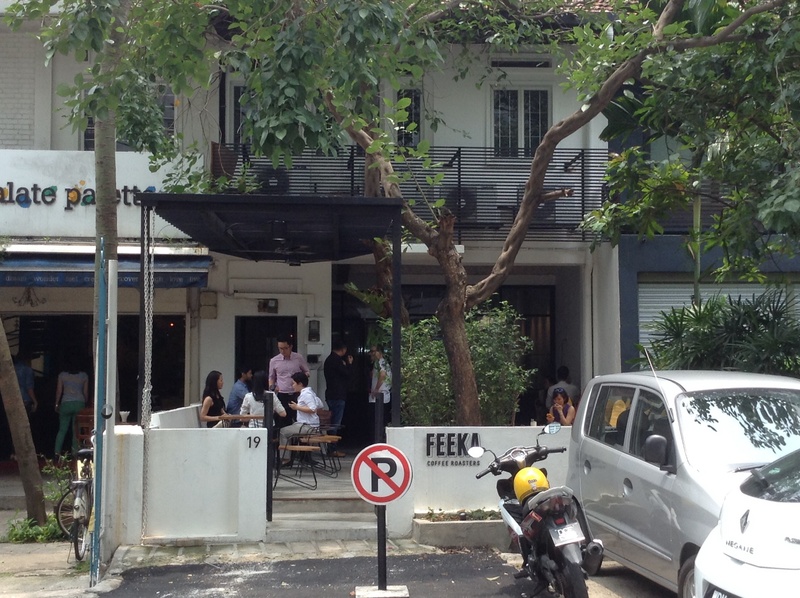 We found Feeka tucked away in the middle of a shady row of houses turned businesses. It isn't very obvious at first; the cafe sits calmly underneath a canopy of leaves, and the shop sign doesn't call a lot of attention to itself. The exterior is a lot of clean lines softened by the presence of a thriving tree. Some of the seats are tough and black, while others are a cheerful sunny yellow. 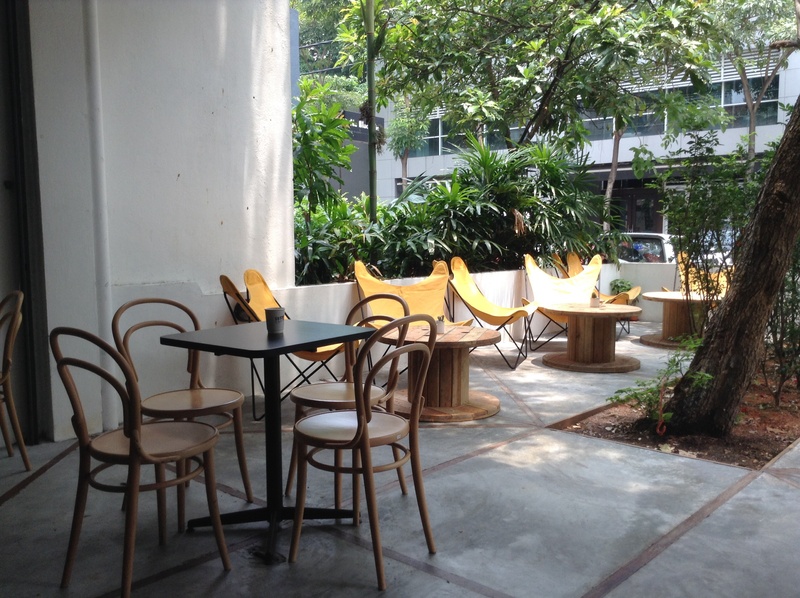 The interior on the other hand is a careful balance of industrial touches and nature, evident in the few ferns and prominence of wood in the decor. On one end, there is a sofa and comfy couches with postcards of watercolour birds on the wall. Further in, naked bulbs hang from the ceiling on draping wires, while a sunroof pours a fresh pool of light onto the order counter and coffee bar. There is an air of peaceful calm in this setting, and I felt instantly zen. Dining outdoors here is a visual treat. Everything you want from a big breakfast. So in the end, I decided to splurge a little and get myself the Feeka big breakfast (RM20). I really couldn't resist, and when the dish arrived at my table, I knew I had made the right choice. 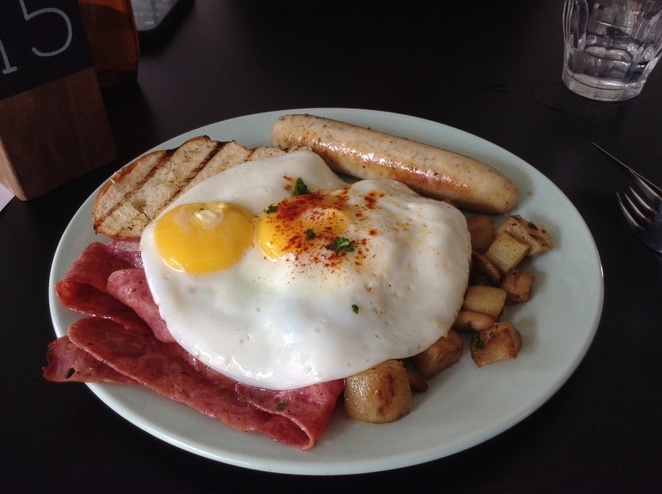 My dish was piled high with fresh sunny side eggs, sauteed potato chunks, beef bacon, a chicken sausage, a buttered brioche slice and some mushrooms hidden under the eggs. I started with the eggs, which were that perfect consistency between runny and solid. The potatoes were soft and tender, and the mushrooms were melt in your mouth amazing. The chicken and beef bacon were good and juicy, going well with the fluffy brioche. I was suitably stuffed by the end of my meal. The Feeka omelette (RM16) was my colleague's choice. 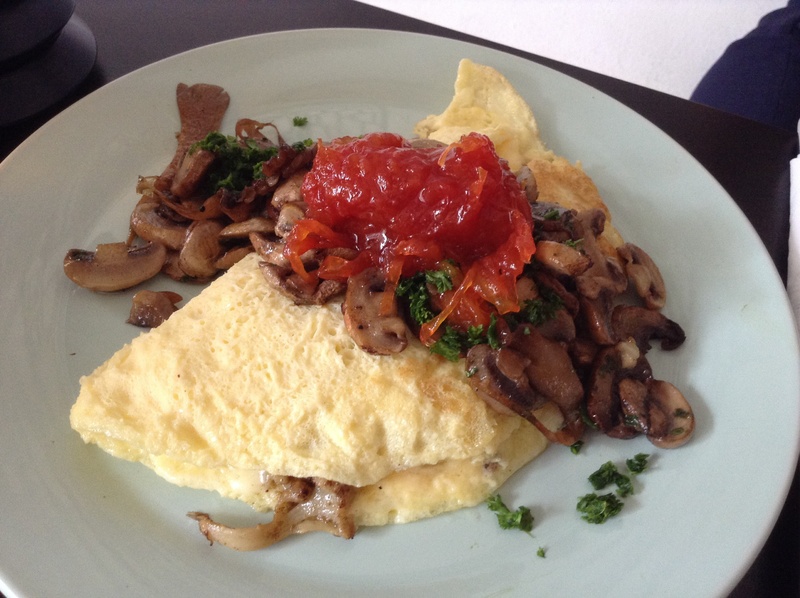 This was a fat, fluffy cheese filled omelette topped with sauteed mushrooms, herbs and sweet tomato jam. I didn't taste the omelette, but it looked deliciously soft. The sweet tomato jam was an interesting experience ... the taste reminded us of the acar you usually eat with briyani. Of course as I mentioned earlier, breakfast is not the only thing on the menu. There are different types of pasta, sandwiches and even steak. 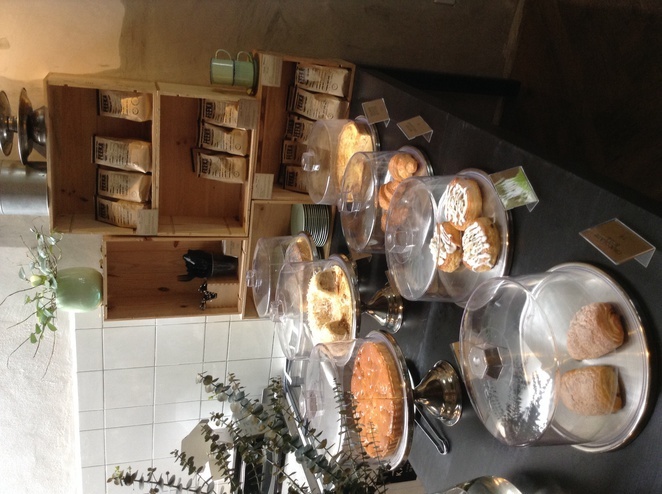 And if you take a look at the table next to the cashier counter, there are even some cakes and pastries too. 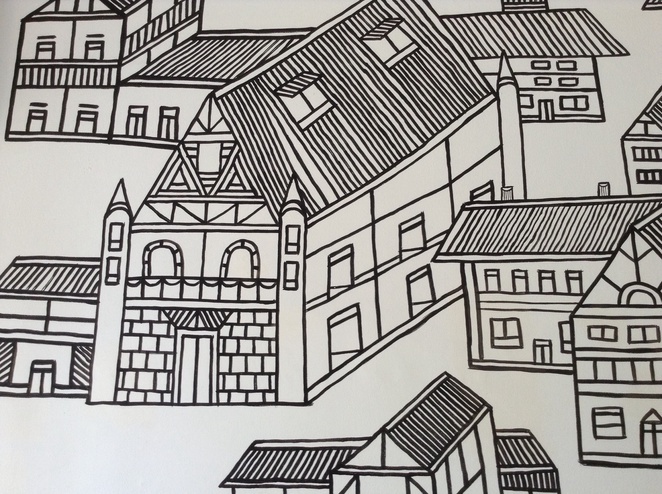 I love how everything is laid out here. This feature wall was painted by hand. 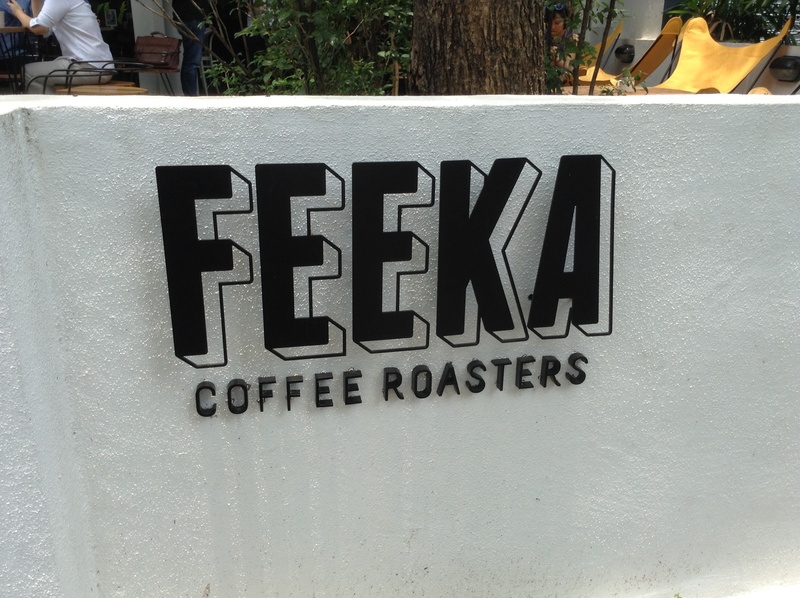 I know it must be pretty sad that I went to a cafe called Feeka Coffee Roasters without tasting their coffee, but I'm afraid I'm not much of a coffee drinker so I won't be able to comment on that. But if you have tasted their coffee, please share your experience in the comments below. Coffee aside,Feeka is a beautiful and peaceful cafe, and the breakfast dishes in particular have a very 'comfort food'-esque flavour. Apparently the word 'fika' in Swedish means "have a break with a drink and some food" with colleagues, friends, a date or family. 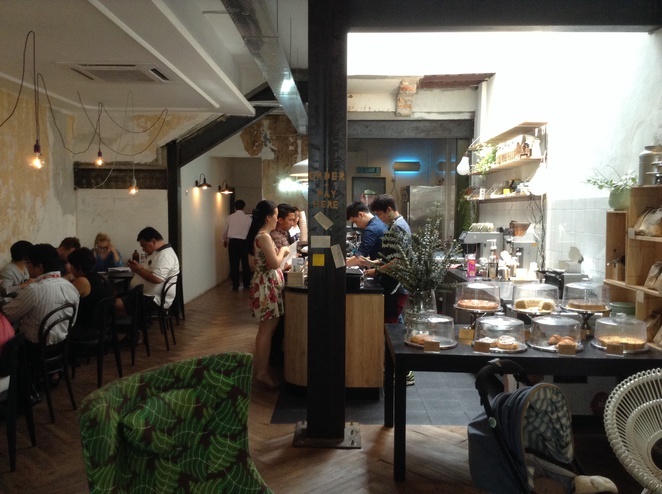 The word seems to resonate with warmth and relaxation, and it fits this charming cafe perfectly.